NOA | Good Drinks, Good Times..Using Sparklers at Nightclubs - NOA | Good Drinks, Good Times.. If you’re trying to get the leg up on your competition in the nightclub business, then you know just how important it is to offer a more exciting experience to your customers than anyone else in town. It is not uncommon to ramp up your promotions and entertainment such as live bands and DJs, and if you go that route you should probably do more in the area of marketing. However, though that type of large-scale effort is sure to help you bring in the crowds, it is equally important to make sure your customers are having the time of their lives once they’re in the front door. One way you can do this is by using sparklers in your nightclub, and there are a variety of ways to pull this off. First of all, I’ll start by saying that you need to make sure that using sparklers inside your club is legal in your area. 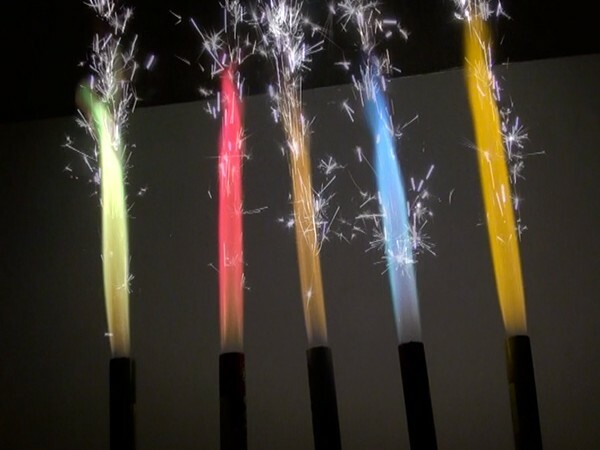 Even if the use of sparklers is legal for other types of events, it can sometimes be regulated for indoor use or at commercial properties without a special permit. Assuming you have done your homework and using sparklers is acceptable according to law, here are some popular ways to use them to help you make your customer’s experience better and drive more sales. As a nightclub owner, you probably already know how valuable large groups from weddings and other types of events can be to earning revenues. Many bars and nightclubs have a special room set aside that groups can book, but if you’re not tapping into this market already you should probably consider it as a great source of additional cash flow. Whether you’re talking about bachelorette parties or hosting wedding receptions, having sparklers on hand for these types of groups can make their experience better and ultimately drive up demand for your venue. Bottle service has become a very popular way to drum up more sales in recent years, and if you’re not offering bottle service at your bar or nightclub then you are missing out on a huge opportunity. Assuming that you’re already tapping into this trend, there are ways of using sparklers to make your bottle service better than the competition’s. There are special sparklers called bottle sparklers that you can attach to your bottles while the server is delivering them to the tables that will draw the attention of your other patrons and make the experience better for those who purchase the service. This will almost immediately increase demand for bottle service and ramp up the amount of profits you earn starting on day one. Many people go out to their local bar or nightclub to celebrate their favorite holidays, and sparkelrs can make your venue the hottest place in town. Whether you’re talking about New Year’s Eve, the 4th of July, or another busy holiday, customers will love being able to participate in the celebration using sparklers. The best part is that sparklers are very inexpensive and add a huge “wow” factor to any party, so you can keep your customers entertained and buying more drinks for just a few pennies per seat.